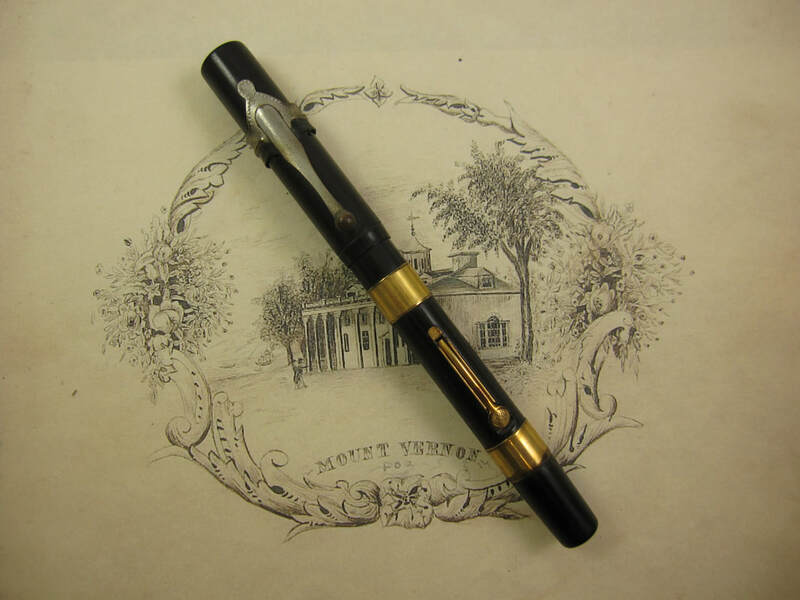 COMMENTS: Waterman 52 in black chased hard rubber and gold trim. 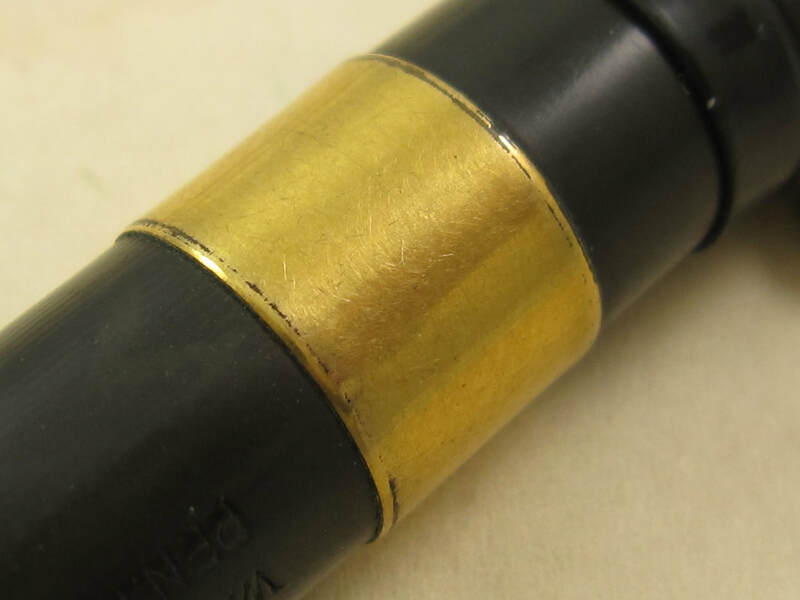 Wide ornate gold band on the barrel. Clipped cap. 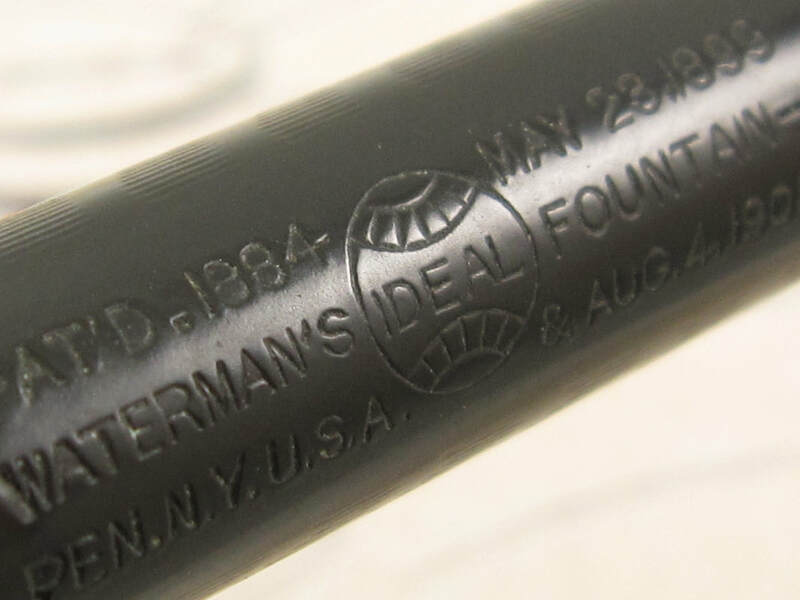 Fitted with a 14k Waterman Ideal #2 superflex nib that writes a fine to triple broad line. Professionally adjusted nib, ultra smooth, and capable of writing at any speed when not flexed. Great barrel imprints. 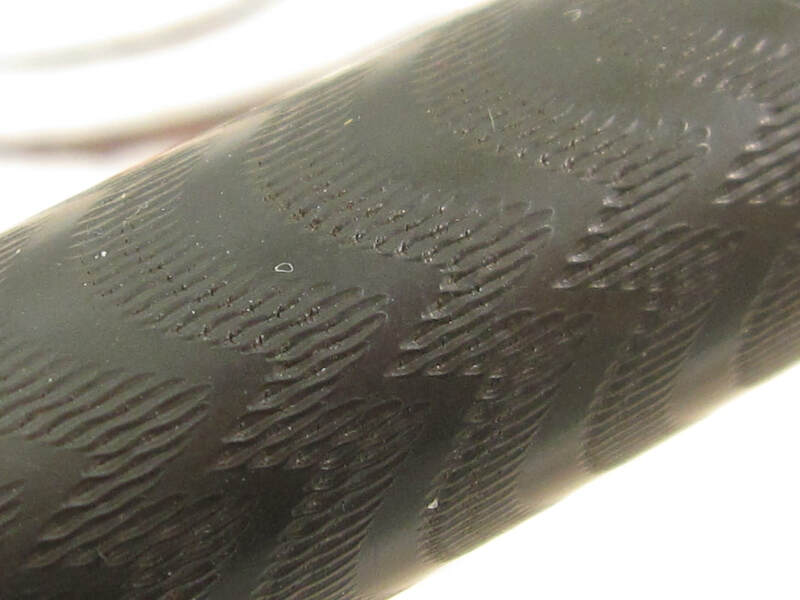 Very crisp hard rubber with lots of black color luster. 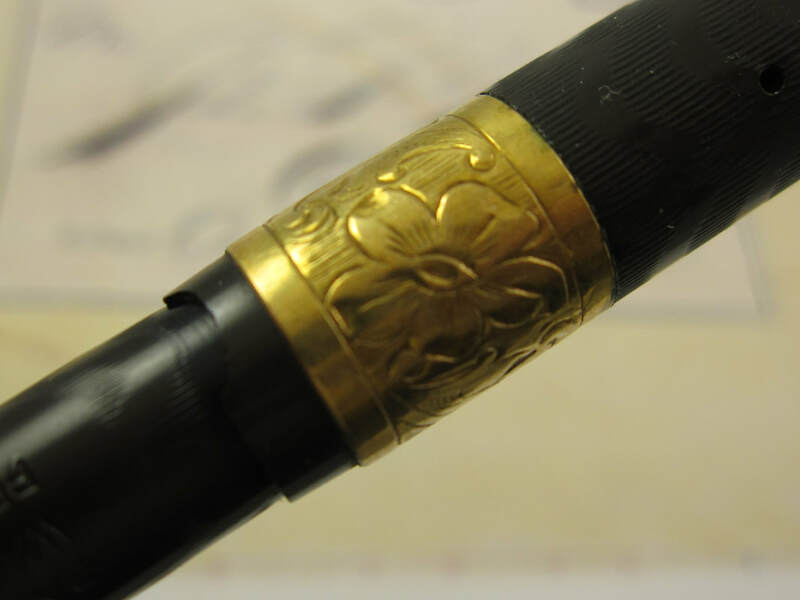 No engravings on personalization on the ornate gold band's indicia or the barrel. Minor brassing and tarnish on the gold trim. Otherwise, this pen would be marked as in near mint condition. Lever filler. New sac. Presentation box and papers includes. Box is also in awesome condition. Made in the USA in the 1920s. 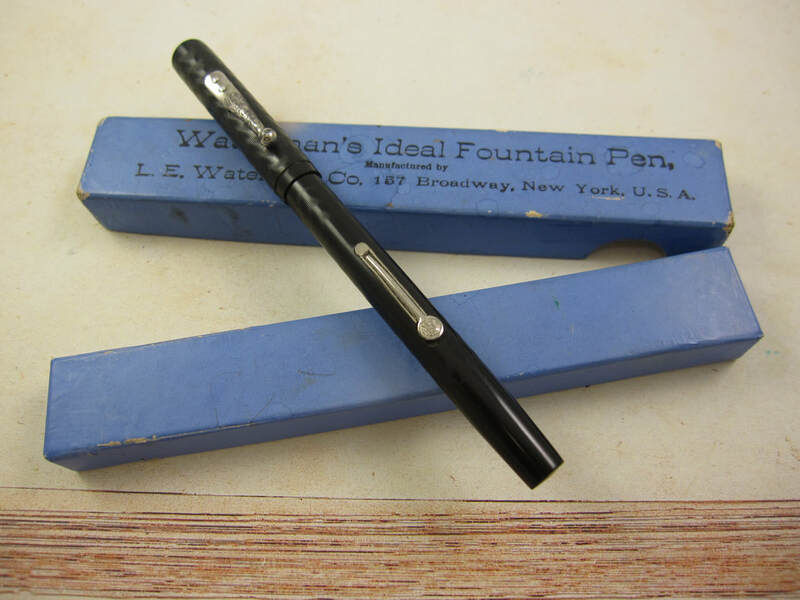 COMMENTS: Waterman 52 fountain pen in black chased hard rubber and nickel trim. 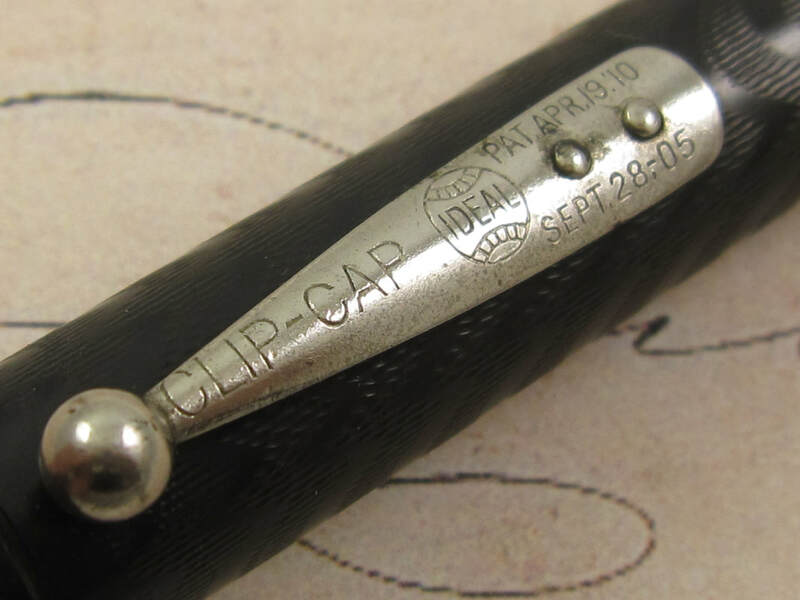 Clipped cap. Fitted with a Waterman Ideal #2 medium flex nib that writes a fine to double broad line. Professionally adjusted nib. Ultra smooth and capable of writing at any speed when not flexed. 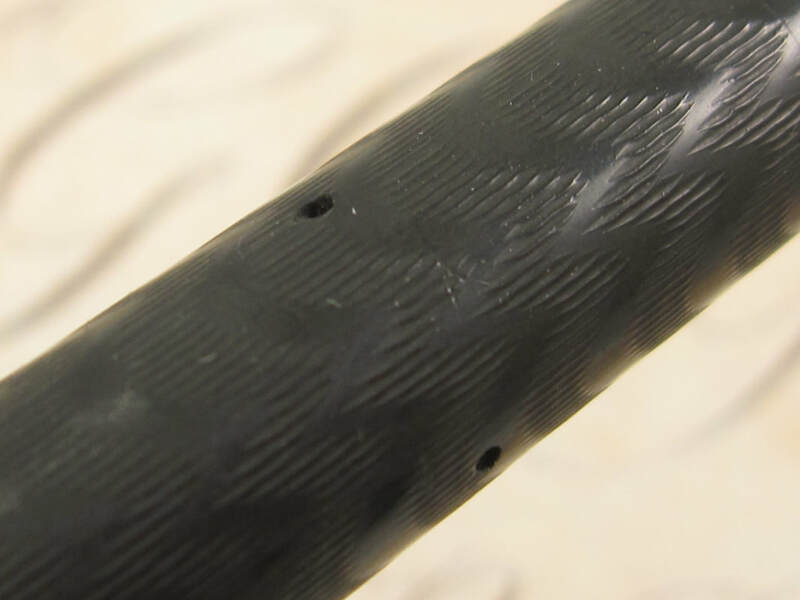 The color is graded as "very good" due to light discoloration in the black hard rubber. The lever box has tarnish. 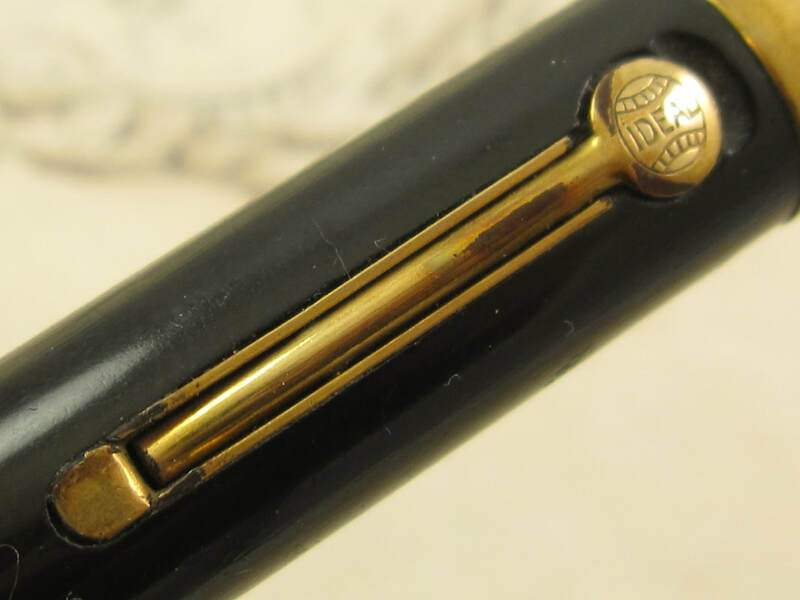 Otherwise, this is a very clean pen with a great vintage 14k Waterman flex nib. Lever filler. New sac. Made in USA in the 1920s. 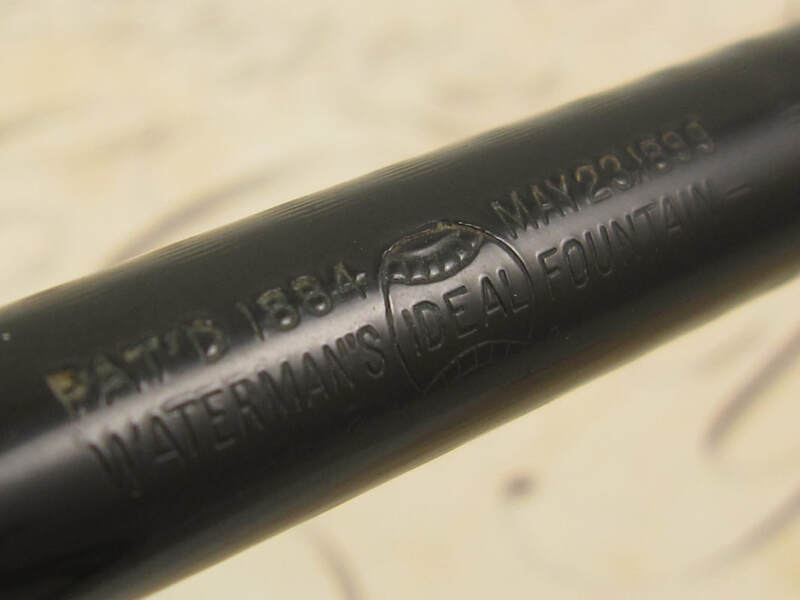 COMMENTS: Waterman 52 1/2 pen in black chased hard rubber and nickel trim. Slim profile pen body. Clipped cap version. 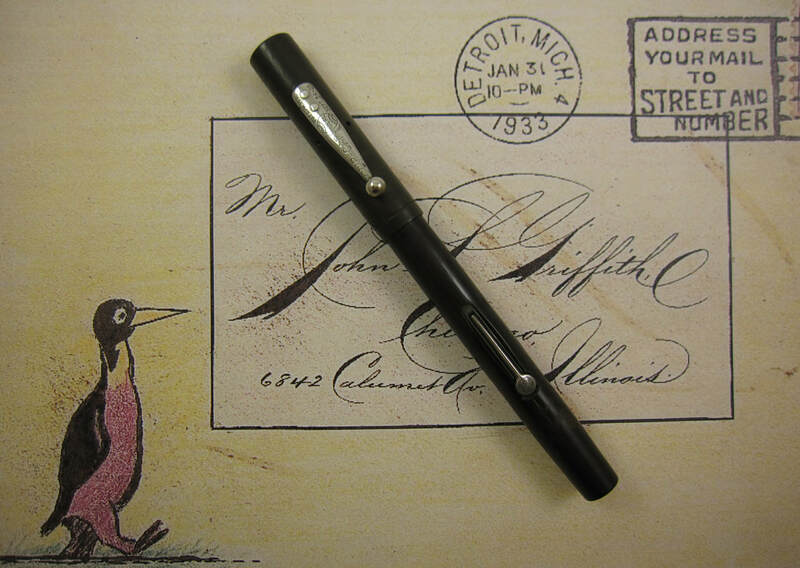 Fitted with a 14K Waterman Ideal #2 medium flex nib that writes a triple extra fine to double broad line. 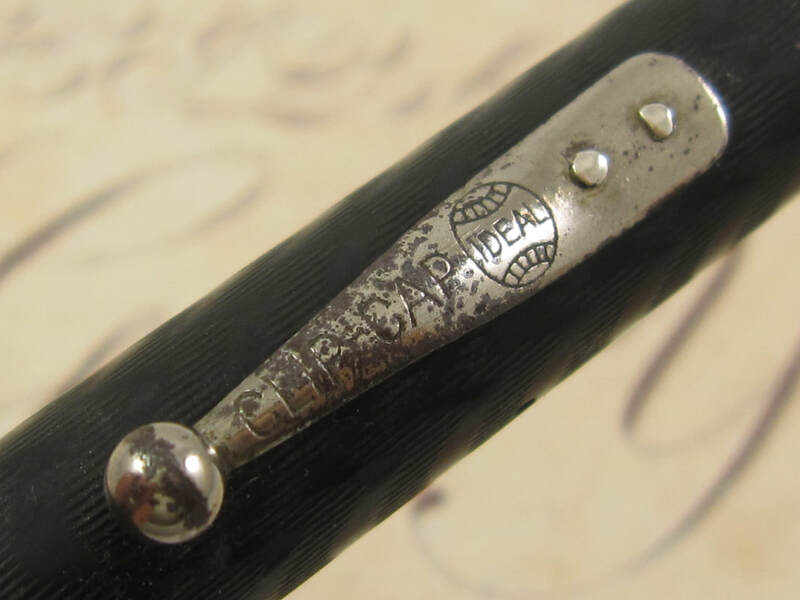 Professionally adjusted nib, ultra smooth, capable of producing the thinnest lines a flex nib in a fountain nib can make, and also capable of writing at any speed when not flexed. 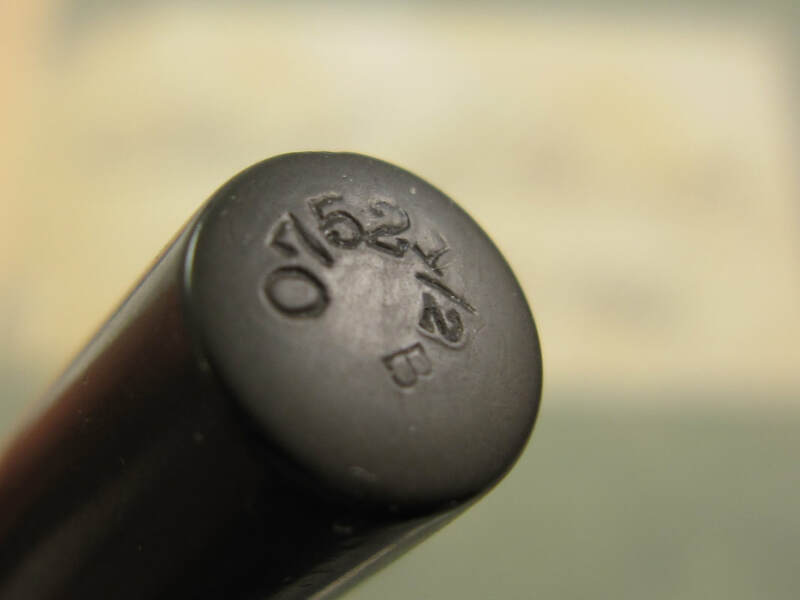 These attributes make this nib a highly desirable and a valuable one. Chasing and barrel imprints are in near mint condition. With the exception of the clip, nickel trim is in outstanding condition. Clip has significant brassing. If it were not for this single cosmetic blemish, this pen would be graded as in near mint condition. Lever filler. New sac. Made in USA in the 1920s. Please excuse my mistake in the writing sample. 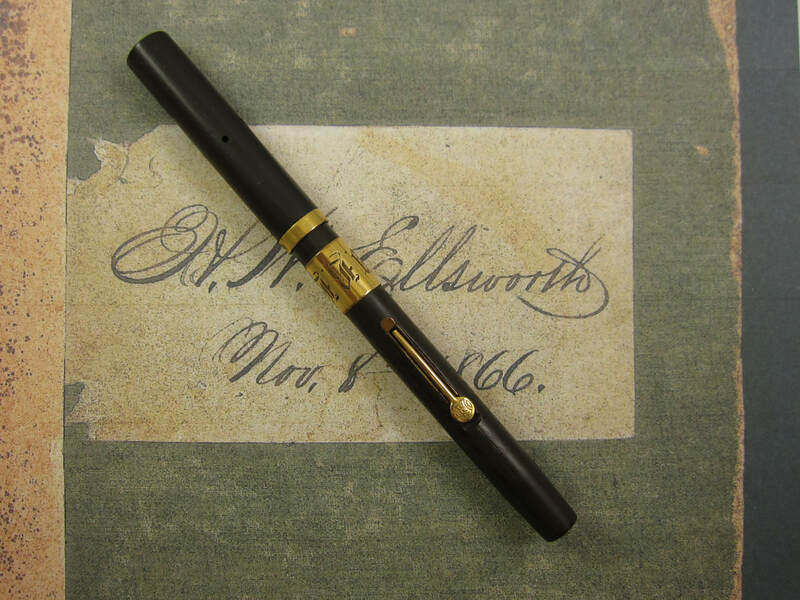 It should read "54", not "14"
COMMENTS: Waterman 0752 1/2 pen in black chased hard rubber and gold trim. Wide gold band on the barrel. Clipless cap (from the factory). 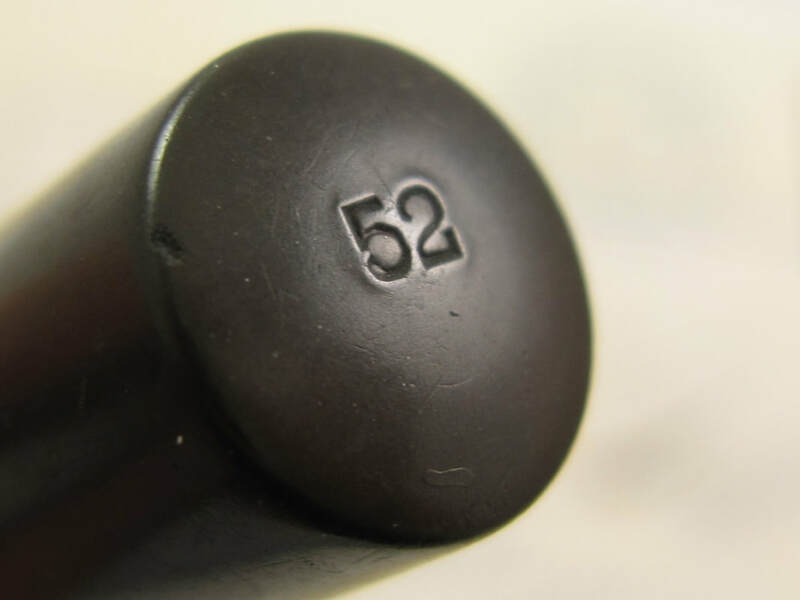 This is a slightly different variation of the iconic Waterman 52. 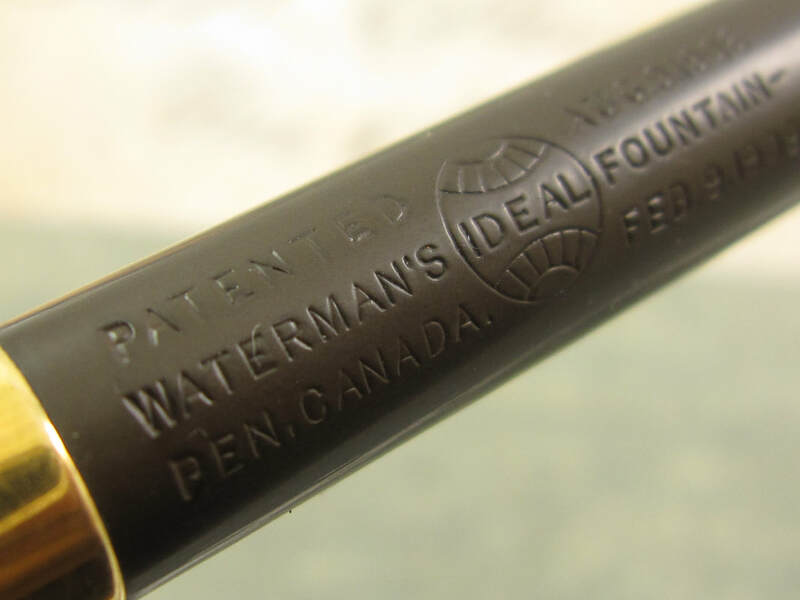 Its main difference to a Waterman 52 is that is comes with a wide gold band in the barrel (hence the 07 prefix in its model number), and that it has the slim profile (hence the 1/2 in its model number). 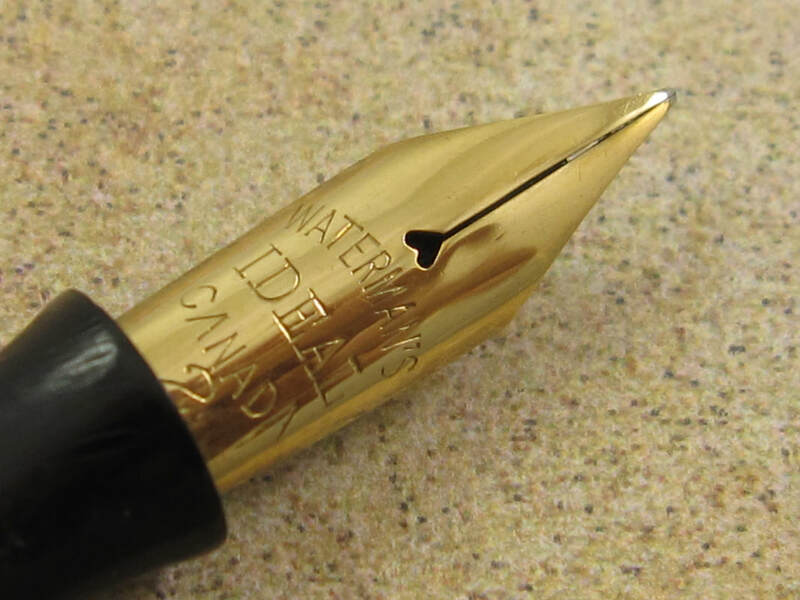 Fitted with a Canadian 14k Waterman Ideal #2 medium flex nib (border line with a superflex) that writes a fine to double broad line. Professionally adjusted nib, ultra smooth, and capable of writing at any speed when not flexed. 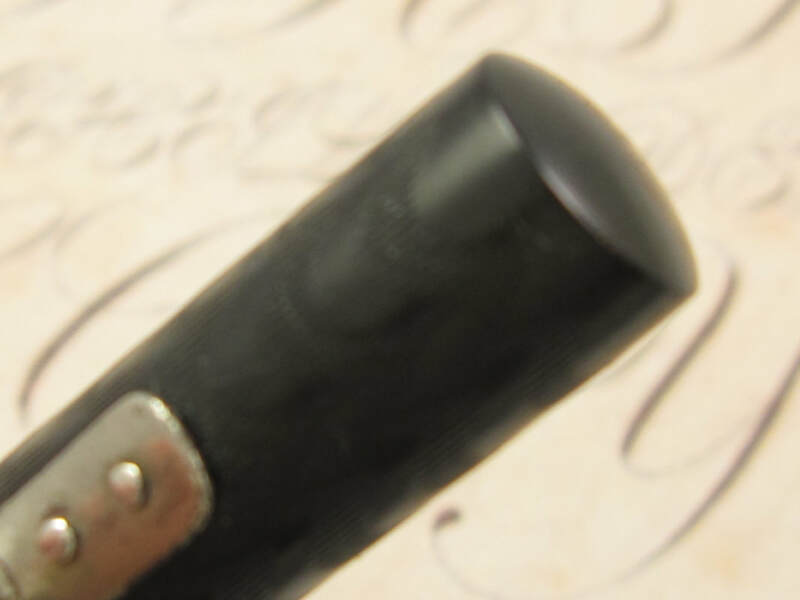 Exterior of the pen has some discoloration. 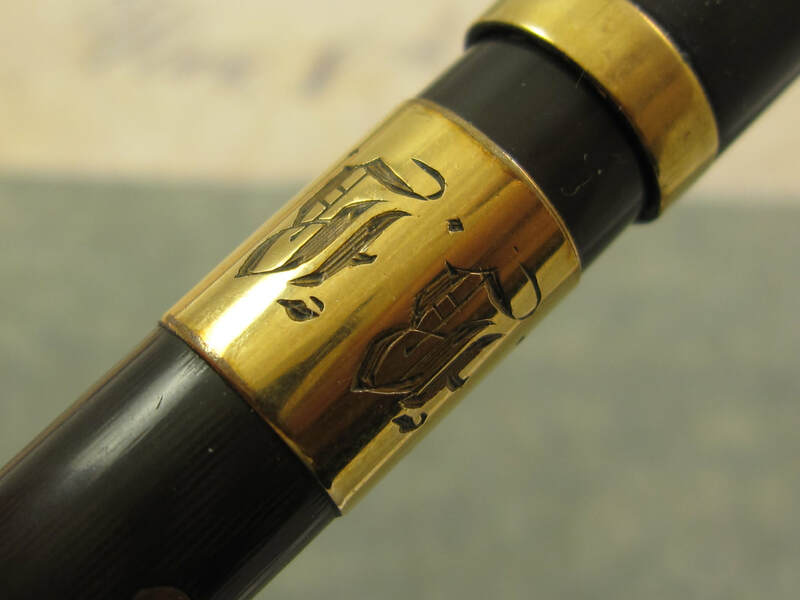 Wide gold band on the barrel has been professionally monogrammed with the "F.F.M." initials. Some tarnish on the lever. Otherwise, this is a very clean pen. Lever filler. New sac. Made in Canada in the 1920s. COPPERPLATE & SPENCERIAN NIB !!! COMMENTS: Waterman 0852 1/2V in black chased hard rubber and gold trim. Ornate wide gold band on the cap. Clipless cap (from the factory). Fitted with a 14K Waterman Ideal #2 wet noodle nib that writes a triple extra fine to triple broad line. 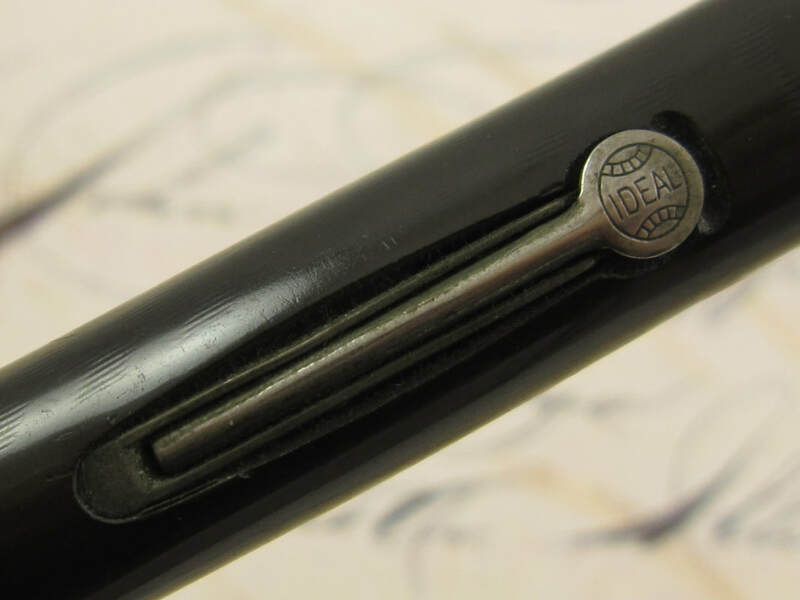 Professionally adjusted nib, ultra smooth, capable of producing the thinnest possible lines with a fountain pen nib and also capable of writing at any speed when not flexed. 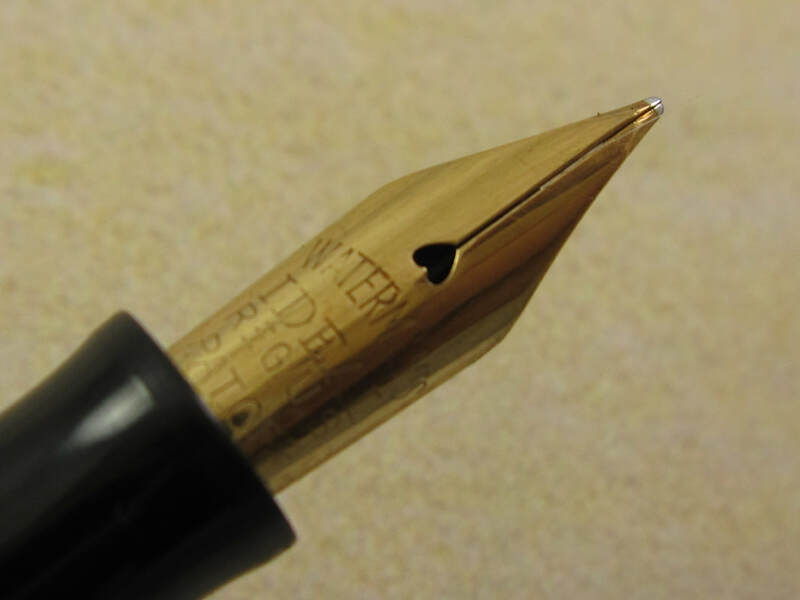 It is extremely rare to find a very flexible nib capable to produce XXXF lines and still be an ultra smooth nib capable of writing at any speed when not flexed. 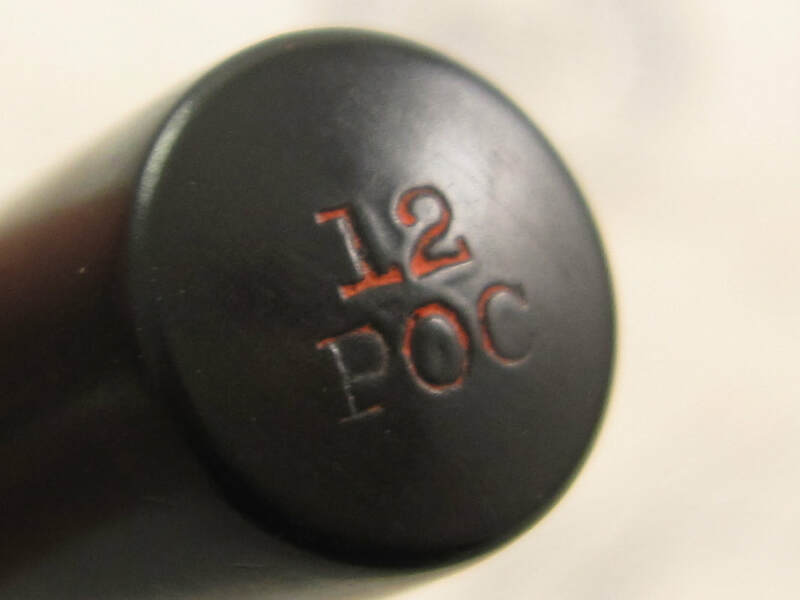 This is a factory original nib, not a modified or re-tipped one. Great chasing. Some discoloration on its exterior color. Great barrel imprints. Gold trim is in perfect condition. Cap lip has a very tiny piece that has chipped off (as shown in a picture above). Lever filler mechanism. New sac. Made in USA in the 1920s. 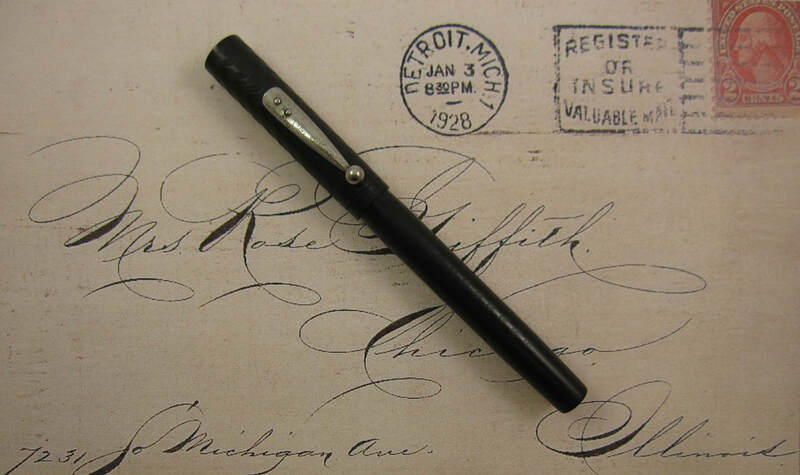 COMMENTS: Waterman 52 1/2 fountain pen in smooth black hard rubber and gold trim. Ornate gold band on the barrel. Clipless cap version, from the factory. Fitted with a 14K Waterman Ideal #2 wet noodle BB stub nib. Professionally adjusted nib. 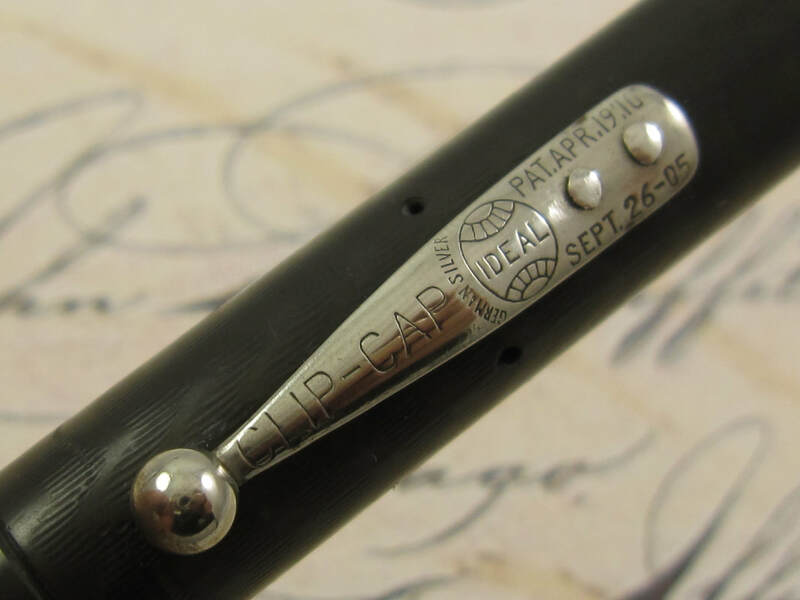 Ultra smooth, capable of writing at speed when not flexed ... this is a highly desirable and very valuable vintage superflex nib. The exterior of this pen has been reblackened and displays very nice color. Good barrel imprints. Lever box has a tiny spot of brassing, otherwise it is very clean. Lever filler. New sac. Made in USA in the 1920s. USER GRADE PEN BODY !!! 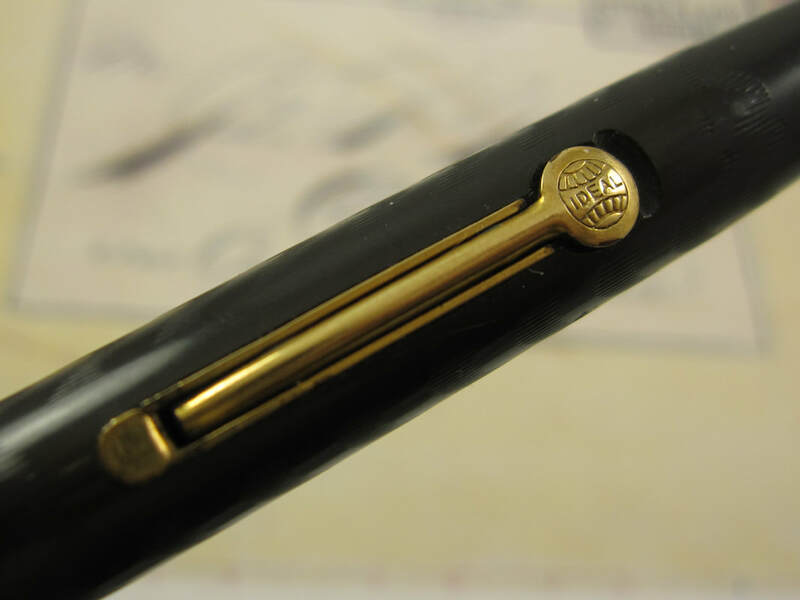 COMMENTS: Waterman 52 1/2V ring-top in black chased hard rubber and gold trim. Cap also has an ornamented and very wide gold band. Fitted with a 14k Waterman Ideal #2 wet noodle nib that writes a fine to double broad line. Professionally adjusted nib, ultra smooth, and capable of writing at any speed when not flexed. Extremely clean pen. Chasing and exterior color is in amazing condition and with lots of black color luster. Very clean gold trim. This pen was intentionally designed to be used as a posted pen, becoming a full size pen and offering great balance. Pen measures 4 1/4" in length (capped) and 5 1/4" in length (posted). Lever filler. New sac. Made in USA in the 1920s.